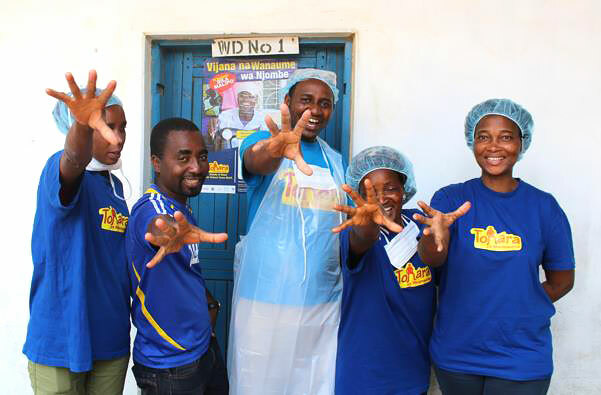 Njombe, Tanzania—VMMC providers at Itulahumba Dispensary give a high five to celebrate the 500,000 VMMC milestone. Njombe, Tanzania – When the HIV prevention team arrived in the village of Itulahumba last year, Daudi Nyagawa and his friends were ready to participate in the voluntary medical male circumcision (VMMC) campaign and safeguard their health. That hadn’t always been the case. 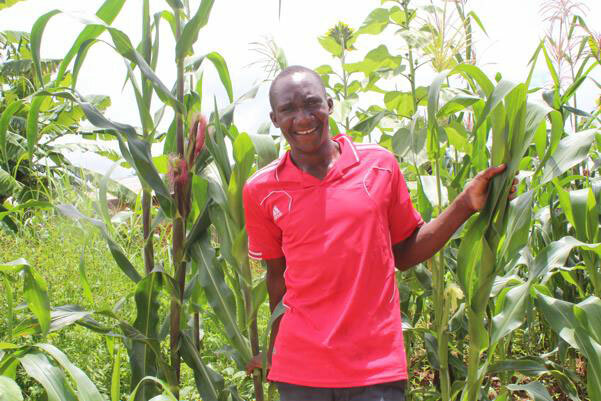 Nyagawa, a 23-year-old corn farmer, and other men in the village had been skeptical of VMMC, hearing the rumor that the procedure would make them “unable to father a child.” Additionally, circumcision was uncommon for men in their community. “When we first heard of these services at the village meeting with campaign organizers, my friends and I vowed never to be circumcised,” said Nyagawa. So what changed? The women in the village—empowered with the knowledge that VMMC also benefits women’s health—began pressuring their partners, spouses and other male relatives to participate in the HIV prevention campaign. “It was like the women in this village had spoken to each other. They would no longer accept a non-circumcised man,” Nyagawa admitted. Research has demonstrated the effectiveness of male circumcision in reducing the risk of female-to-male sexual transmission of HIV by up to 70 percent, compared to uncircumcised men. In addition, women with circumcised partners face a lower risk of developing cervical cancer, the leading cause of cancer-related deaths among women in Tanzania. As part of a comprehensive package of health services offered along with circumcision, Nyagawa and other men in his village received education about circumcision, HIV testing and counseling services, screening for sexually transmitted infections, advice on risk reduction, and guidance on condom use along with the circumcision. Now these men are among the more than 530,712 Tanzanians who have received VMMC services through Jhpiego-supported programs led by the Ministry of Health, Community Development, Gender, Elderly and Children in partnership with the US President’s Emergency Plan for AIDS Relief and the United States Agency for International Development (USAID). Daudi Nyagawa, a corn farmer in Itulahumba, Njombe, is one of 500,000 clients who have benefited from VMMC services provided by the Tanzanian government in partnership with USAID-supported programs and Jhpiego. Nyagawa’s characterization of the experience of VMMC’s acceptance reflects the changing attitude of men and youth in Tanzania’s high HIV-prevalence regions of Iringa, Njombe and Tabora. Jhpiego began working in these areas 6 years ago under the leadership of the Ministry of Health and local government authorities. Since then, male circumcision has become the norm in preventing HIV, and the VMMC health teams have reached nearly 80 percent of the target population. Increasing access to VMMC services has been one of Jhpiego’s key contributions to preventing the spread of HIV in sub-Saharan Africa. In Tanzania today, Jhpiego is working through USAID’s AIDSFree program led by John Snow, Inc.
With guidance from the Tanzanian National AIDS Control Program, Jhpiego and health administrators in the three high HIV-prevalence regions of Iringa, Njombe and Tabora have scaled up services in every village, giving boys and men like Nyagawa the opportunity to receive substantial protection against HIV and other sexually transmitted infections while engaging them in sexual and reproductive health services. When used in combination with other measures—including condoms, partner reduction and abstinence—circumcision is an important addition to men’s HIV prevention options. Mathematical modeling has shown that efficiently reaching a large number of uncircumcised men with VMMC services in populations with a high prevalence of HIV and a low rate of circumcision dramatically reduces the incidence of HIV cases in that particular community and saves billions of dollars in future HIV care and treatment costs. To ensure that services continue beyond the life of the USAID-funded project, program staff and regional and district health administrators are working together to incorporate VMMC and early infant male circumcision into routine care. They are also evaluating innovative circumcision methods such as medical devices that remove the foreskin without the need for injected anesthesia or sutures. Since his participation in the program, Nyagawa has another reason to be pleased about the health benefits of VMMC. “My wife had a baby girl. We are so happy,” said the new father.